OpenStreetMap has been thriving in the ArcGIS Platform for a number of years as a tiled basemap and through the Vector Basemap (currently in beta). But did you know that there is a free ArcMap add-on for extracting and using OSM vector data? The ArcGIS Editor for OpenStreetMap makes it possible to query and filter the mass of spatial data available in OSM’s database, currently estimated to be over 1 TB when uncompressed! Area of Interest in Edinburgh using the OpenStreetMap Basemap. What data is available and how can I make use of it? OSM data is available as themes, with data ranging from well known geographic concepts such as land-use, roads and waterways; to information regarding business locations, building heights, points of interest and more. To cover all the data types that are available, would take nearly as long as downloading the entire OSM database (theoretically just under 50 hours according to my broadband speed). paths for the UK, queried using the tag value highway = path. Note, these aren’t always rights of way. Another example of data that can easily be extracted from OSM is cycleways. Here are the cycleway paths contributed by the OSM community in the Milton Keynes area. 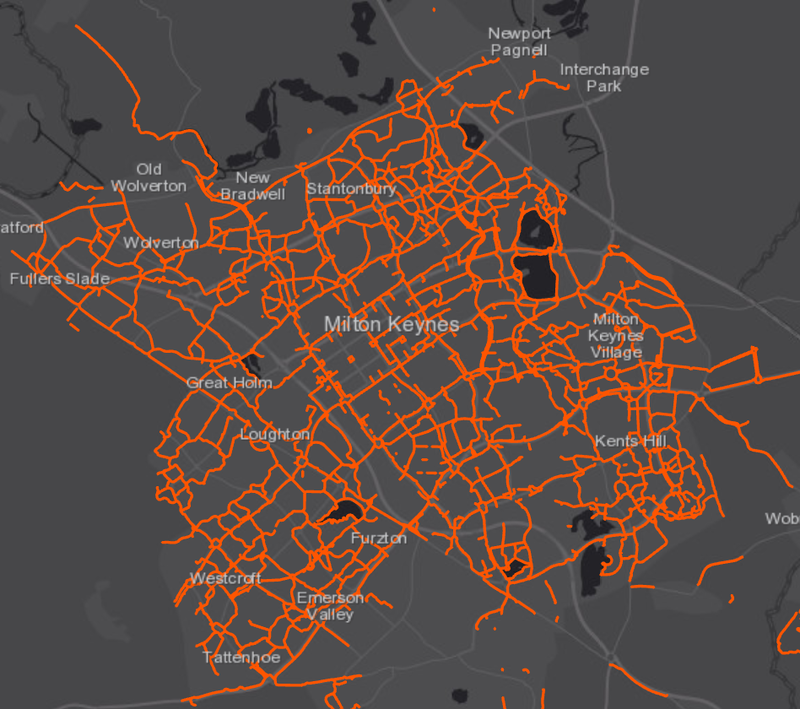 Cycleways extracted from OpenStreetMap in the Milton Keynes area. Of course, OpenStreetMap isn’t just limited to line data. Building footprint data is rich in detail in OSM and is one of the most often contributed. With this building data, OSM contributors can also provide the name of the building and its type - such as a store, tower, residential block or sports centre. This type of data is crucial for business’s seeking to be accurately featured in maps that use this crowdsourced data. Building footprints extracted from OpenStreetMap in London. Speaking of business locations, the biggest geometry type that’s submitted in OpenStreetMap is, you guessed it, points. Called Nodes in OSM, there are nearly 140 million tagged points - that’s a lot of amenities, points of interest and business locations to make use of and explore. And if all of that hasn’t grabbed your attention, there’s even the potential to create 3D applications with OpenStreetMap data. The screenshot below shows a 3D model of Royal Hospital London. Royal Hospital London 3D Web Scene. As OpenStreetMap is free to anyone to contribute, organisations can benefit from ensuring their public assets or store locations are accurately mapped. To discover even more about OpenStreetMap, how to contribute and its potential in the ArcGIS Platform, check out this Storymap. It takes an in depth look at how OSM works and contains useful links detailing applications of the data – such as the ability to create your own Network Dataset!